Looking back at the heyday of the Philip Jones Brass Ensemble it is hard to believe that three stalwarts of the group are no longer with us, namely the founder himself Philip Jones, bass trombonist Raymond Premru, an American but for many years a fixture in the trombone section of the Philharmonia and perhaps most untimely of all, virtuoso tuba star John Fletcher. This 1985 recording comes from the period shortly before the ensemble regrouped as London Brass and concentrates on the lighter side of their repertoire. It draws on a number of encore items most of which were arranged by members of the group and framed by two larger scale suites by Gordon Langford and Jim Parker, in both cases light on the ear yet anything but light on the technique of the players. Gordon Langford is no stranger to brass players having contributed a string of fine arrangements and original compositions to the brass band repertoire. His suite, London Miniatures, was originally written for the group to take on foreign tours and is typical of Langford in its infectiously melodious and harmonically attractive style. The six brief movements draw on a variety of well known London landmarks, amongst them a fanfare like opening scherzo, London Calling, a suitably cheeky burlesque tribute to Soho complete with sleazy tuba and trombone solos, Trafalgar Square in an entertaining take on the Hornpipe (sample one - track four) and a contrasting Elegy that forms a touching portrait of the Cenotaph, cleverly weaving in a reference to the Last Post. Jim Parker turns the musical scenario around in his five impressions of a Londoner�s response to the sights and sounds of New York, taking in Grand Central, Harlem, The Chrysler Building, Central Park and Radio City. Parker is best known for his television music although has since written for brass again, namely an excellent piece entitled The Golden Section (Linn CKD 092) for the Wallace Collection, who coincidentally were formed by trumpeter John Wallace the year after this PJBE recording was made. Parker displays a similar talent for melodic invention to Langford, albeit wrapped up in a more overtly jazzy and technically challenging style with some imaginative effects thrown in for good measure (sample two - track thirteen from 1:35). 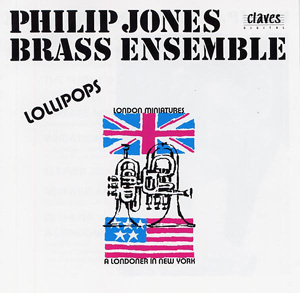 Philip Jones loved his "lollipops" and for all the fine work he did in commissioning major new contemporary scores from leading composers he always encouraged the members of the group themselves to contribute items with trombonists John Iveson and Roger Brenner becoming notably productive in this respect. This versatility was always central to Jones�s original conception and no doubt, in part at least, accounted for the group�s phenomenal popularity. The two soloists here are worthy of particular mention, John Fletcher a staggeringly agile bumble bee in the Rimsky-Korsakov (sample three track seven) and Frank Lloyd flawlessly articulate on the horn in Arban�s famous set of variations on a Tyrolean mountain song, an "air varie" that has been encountered by and challenged generations of cornet players. PJBE enthusiasts may remember Jan Koetsier for a fine Symphony he wrote for the group although his Kleiner Zirkusmarsch finds him in lighter mode, no less challenging but with tongue firmly in cheek. If I have a criticism of this disc it is a disappointing playing time of just under forty-six and a half minutes. Otherwise the playing of the group is characteristically slick and will delight both brass enthusiasts and those open to a little light musical entertainment alike. The PJBE were a prolific ensemble in the recording studio and with so much of their material not having been re-released since the days of vinyl it is only to be hoped that a suitably enterprising label will see fit to delve into the archives and remaster what were in many cases major achievements in the genre.